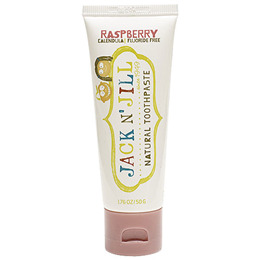 Jack N’ Jill Natural Toothpaste contains Certified Organic Flavouring. Safe if swallowed as it is Fluoride Free, Sugar Free, Colour Free, SLS Free, has no Preservatives and is Gluten Free and contains no allergens. It is rich in Xylitol and has Organic Calendula to soothe gums. Tastes YUM! It is suitable to use from six months onwards and it is a wonderful natural toothpaste to continue using into adulthood! Use a small amount on suitable Jack N` Jill toothbrush. Brush gently in a circular motion twice a day, after meals. Safe if swallowed when used as directed. Below are reviews of Jack N` Jill Natural Toothpaste Organic Raspberry - 50g by bodykind customers. If you have tried this product we'd love to hear what you think so please leave a review. Jack N’ Jill Natural Toothpaste contains Certified Organic Flavouring. Safe if swallowed as it is Fluoride Free, Sugar Free, Colour Free, SLS Free, has no Preservatives and is Gluten Free and contains no allergens.